As Americans get ready to celebrate 242 years of independence next week, nearly nine in 10 of them are satisfied with the freedom they have to choose what they do with their lives. But while most Americans are happy with their freedom, how do most people outside the United States feel about theirs? The short answer is -- pretty good. Every year, Gallup asks people in more than 140 countries a simple question: "In your country, are you satisfied with your freedom to choose what you do with your life?" 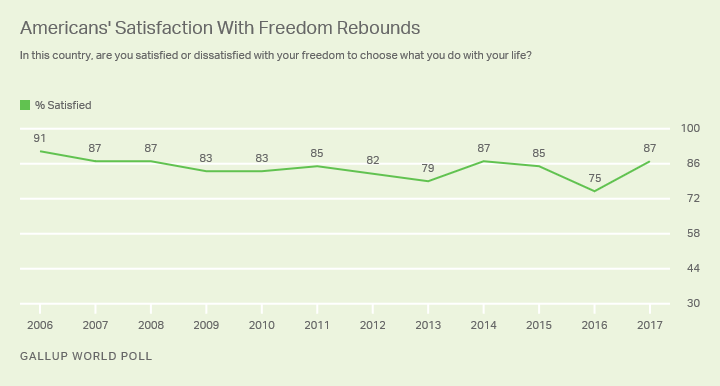 On average, 80% of people worldwide reported in 2017 that they were satisfied with their freedom -- the highest percentage to date in Gallup's global tracking over more than 10 years. In fact, this percentage dropped below a majority in just seven countries last year. The upward trend is largely attributable to at- or near-record-level satisfaction in the world's most populous countries -- China, India, the United States, Indonesia and Pakistan. For example, 85% in China are satisfied with their personal freedom, which is up from 76% the last time Gallup asked the question in 2013. In India, a record-level 86% are satisfied, up six percentage points from the previous year. China's and India's levels of satisfaction are both above the global average -- but they aren't the highest. The top of the list includes some of the wealthiest, most developed nations in the world, but also a few that typically that don't score well on global freedom rankings, including historically repressive regimes such as Uzbekistan. The appearance at the top of the list of countries not usually associated with freedom could reflect social desirability to answer this question positively, as well as fear on the part of respondents about how a negative answer might be interpreted. The countries with the fewest people expressing satisfaction with the freedom in their lives are war-torn countries like South Sudan and Afghanistan. Poor economic conditions in countries such as Haiti or Greece probably explain their respective standings; in fact, before the economic collapse in Greece, 70% were satisfied. Although the U.S. has been known as the leader of the free world, it does not make the top of the list -- and Americans were in a very different place ahead of the last election. In 2016, the U.S. tied the previous low, with 75% of people satisfied with the freedom they have to choose what they do with their lives. The decline saw the U.S. fall from 11th in the world to the bottom half. Over the past year, however, the U.S. has almost perfectly rebounded -- moving back to 87% of Americans feeling satisfied with their freedom. Some of the rebound might be related to economics. Recent improvements in the stock market -- and even the possibility of higher paychecks -- might be influencing how people feel about their overall freedom. Another potential driver could be the election of Republican President Donald Trump. Indicators like economic confidence are highly driven by politics in the U.S. -- meaning when a Republican is in office, Democrats are less like to think the economy is going well and vice versa. Gallup does not collect political affiliation in its global surveys, so we are unable to test whether this is the case. However, we did see that Americans who disapproved of the leadership of the U.S. in 2016 were less likely to say they were satisfied with their freedoms (67%) than those who approved (90%). How people perceive their own freedom will be different. Globally, people may see their freedom through economics first before anything else. This highly aligns with Gallup's previous research on the Coming Jobs War, which found that "what the whole world wants is a good job." Americans celebrate their country's freedom next week. With much of the world unable to experience the same freedoms that Americans enjoy, it is remarkable that so many are still able to celebrate freedom on their own terms. Jon Clifton is Global Managing Partner at Gallup. Americans' feeling of freedom is declining. This drop -- dramatic in the U.S. -- isn't happening in other wealthy democracies. As the world marks World Press Freedom Day on Wednesday, Gallup found that a median of 61% of adults across 131 countries in 2016 said the media in their countries have a lot of freedom, while 28% disagreed. While new media are increasingly available worldwide, perceived media freedom is declining. In 2015, a median 61% of residents across 131 countries said the media in their country have a lot of freedom, down from previous years.